The Montreal Canadiens were eliminated from playoff contention on Friday in heartbreaking fashion when the Columbus Blue Jackets managed to get ahead and clinch the last Wild Card spot of the Eastern Conference in a shootout win over the New York Rangers and the defeat still stinks. It hurts even more for young players like Charles Hudon who is set to become a restricted free agent this summer. The 24-year-old forward always dreamed of playing for the Canadiens and only wants to be part of this franchise. As he cleaned out his locker from the dressing room on Tuesday, Hudon was asked about how he felt leaving the team without knowing if he would be back next year. 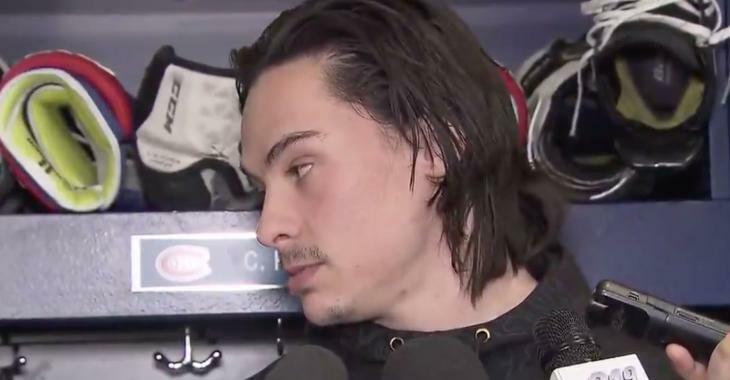 Hudon made a joke, saying it was like leaving your parents’ home when you’re a teenager, but the metaphor was attempted to camouflage the tears and sorrow in his voice as he held back tears when talking about it in French to local reporters. The future is unknown for Hudon, who managed to get a spot in the lineup and take part in 32 games this season. He tallied three goals and a total of five points. Many expected more from the young forward and this could include the Habs themselves. It remains to be seen if a new contract with the Canadiens will be back on the table this summer. Back in 2017, the Canadiens agreed to terms on a two-year, one-way contract extension with Hudon. The deal came in with an average annual value of $650,000.